Through out the summer months, the Spring Texas real estate market has been posting double digit increases in home sales. The month of September was a different story as month over year homes sales increased by a paltry 3%. 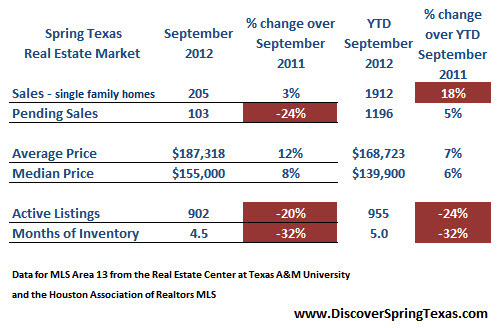 The YTD number for Spring Texas home sales still remain strong with an increase of 18%. There are fewer “For Sale” signs as listing inventory is down 20%. The year 2012 is shaping up to be a much better year for sellers. Listing inventory is down 20%. Days on Market is down 15%. Months of Inventory is down 32%. Average and median home prices up. 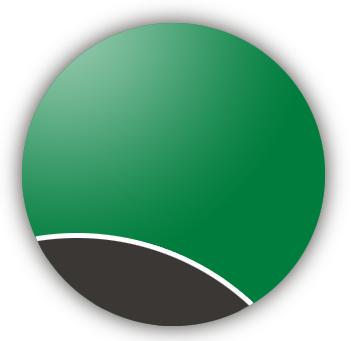 Listing inventory – Active listings are down 20%. Fewer Spring Texas homes for sale translates into less competition for sellers. It’s easier for buyers to make a decision this year than last year as they are not overwhelmed with choices. Months of Inventory – Fewer homes for sale and an increase in home sales has decreased the months of inventory by 32%. Six months of inventory is considered a balance market. More than six months of inventory places the negotiating power in the hands of the buyers. Less than six months of inventory gives the sellers the upper hand. At 4.5 months of inventory, sellers are finally able to dictate the terms of the sale. Home prices – Average and median YTD prices are recording single digit gains but the gains are misleading. Part of the gain in home sale prices is attributable to the increase in the purchasing power of buyers due to lower interest rates. With interest rates being over a 1/2 percent lower this year over last year, buyers are experiencing an increase in their purchasing power. Based on the median sales price of $155,000 and a 3.5% interest rate, the monthly principal and interest is $696. An interest rate of 4.0% increases the monthly principal and interest by $44. Days on Market (DOM) – Measured from the date a house is put on the market until the date it goes under contract. DOM on market for the month was 76. Spring Texas houses are selling 2 weeks quicker this year vs last year. Mortgage Interest Rates – Interest rates are still super low with 30-year fixed rates hovering around 3.5%. Rates on VA loans are even lower. Our clients have been snagging 30-year fixed rates at 3.25% and 100% financing with VA loans. Now that’s a sweet deal!